On the very first night of 1801, astronomer Guiseppe Piazzi discovered something he thought was a new star. He’d been working for some time on a star catalog. So he had been taking careful measurements of the things he saw in the sky and noting their positions as accurately as he could. Of course then, he noticed the next night when the object wasn’t in exactly the same place. Allowing for the possibility that he made a mistake the first night, he looked for it again on the third night and found it to be in yet another place. It had moved the same distance each night. That confirmed to Piazzi he had made careful measurements and he was actually seeing a moving object. He still wasn’t sure what it was though. After making a fourth observation, he decided to call it a comet even though it wasn’t a fuzzy dot like a comet. Piazzi named the moving body Ceres Ferdinandea. Ceres was a goddess of grain. Ferdinand IV was a king of Sicily. Astronomers eventually approved the name Ceres and rejected Ferdinandea. There’s a longstanding tradition of naming heavenly objects and constellations after gods and goddesses whose stories are told in many cultures. But astronomers also have a history of rejecting names of political leaders who aren’t always so widely admired. Piazzi and other astronomers who set their gazes upon Ceres were sure early on that it wasn’t really a comet. It looked like a star in the best telescopes they had. But it moved like a planet. The word asteroid, meaning star-like object, came to be the name for this type of object. Within a few years, a few more asteroids were found. Ceres and quite a lot of the others are orbiting the sun between the orbits of Mars and Jupiter. They may be the remains of a planet that never quite came together. They may also be what’s left of one that came apart. We have better telescopes for peering at objects like Ceres today. Spacecraft have even zipped by to get close photographs and to land on asteroids. Ceres itself will be visited for a photographic mission in 2015. The spacecraft Dawn is already on its way. 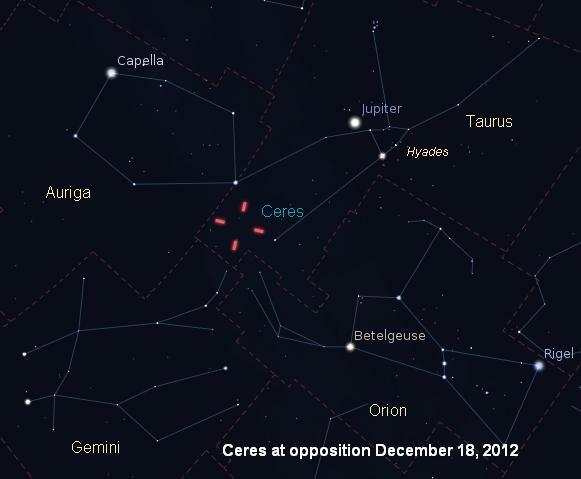 Ceres is at opposition on the 18th. That means it will be up all night. You need binoculars or a small telescope to see it. You also need a dark sky. It will be near the feet of Gemini and somewhat close to Jupiter. Carefully look at the dim stars you see in that part of the sky. Try to memorize their positions. Look again the next night for the object that moved. Here are some links to more information about Ceres. ¡SkyCaramba!